The majority of the evidence of the earliest hominins comes from the Great Rift Valley of East Africa, an expanse that runs from the Horn of Africa at the Red Sea southward to Zambia. During the later Miocene (10 – 5.5 mya) and the early Pliocene (5.5 – 4 mya) at least one lineage of apes made the transition to a more terrestrial and bipedal niche. This shift is thought to have been brought about by climactic changes that were occurring in equatorial Africa at this time. Anatomical adaptations to the pelvis, spinal column, and other body systems followed in suit. A French expedition led by Michel Brunet discovered a fossilized skull which the team nicknamed Toumai, “Hope of Life,” in the Djourab Desert of northern Chad in 2001. 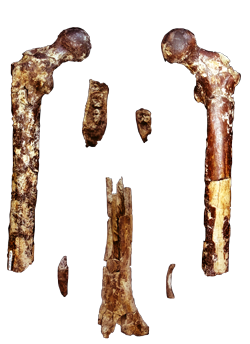 Sahelanthropus tchadensis, the “Sahel Man from Chad,” expands the range of earliest possible Hominins outside of eastern Africa and is possibly the oldest member of the family Homininae (Stanford). The Toumai fossil consists of a fairly complete skull, mandibular fragments, and isolated teeth. 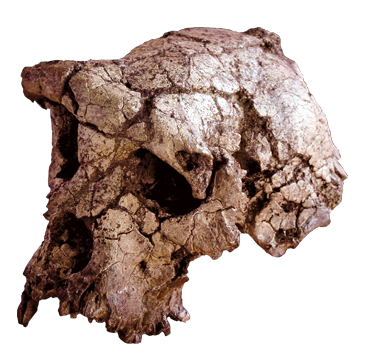 Sahelanthropus contains a mixture of Hominin and apelike characteristics. Hominin characteristics include: large browridge, canine tooth reduction, non-functional C/P3 honing complex, no diastema, and a horizontal nuchal plane. Apelike characteristics include: small brain (320 – 380 cc), U-shaped dental arcade, and thin enamel. The significance of this specimen is still debated given its recent discovery. In 2001 paleontologists Martin Pickford and Brigette Senut announced the discovery of “Millennium Man.” The approximately 6 million year old (myo) fossils were found in the Lukeino formation of the Tugen Hills of Kenya and consists of fragmented cranial and postcranial remains, most importantly femoral fragments. The “Hominin from the Tugen Hills” is argued to be a biped based on internal femur anatomy, but this is not a conclusive bipedal indicator. 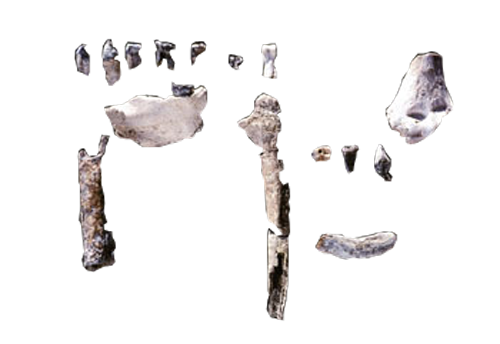 Size of the femoral head and angle of the femoral neck indicate that Orrorin was at least frequently bipedal (Fuentes). Scientists who feel that this is a Hominin point to its thick molar enamel. Others contend that the large canines are much more apelike. In the summer of 2001, Yohannes Haile – Selassie and colleagues uncovered fossil fragments from at least 5 different individuals. They included mandible fragments, at least 20 teeth, finger and toe bones, pieces of arm bones, a partial clavicle, and several other fragments.